The flexibility, durability as well as aesthetical and environmental values of natural wood have inspired the development of new wood product technologies. They enhance the properties of wood and enable construction of wooden multi-storey buildings according to the present building and fire safety regulations. The fire safety standards for wood buildings are high according to international, national and local building regulations. In Europe, the European construction standards form the core of the requirements. 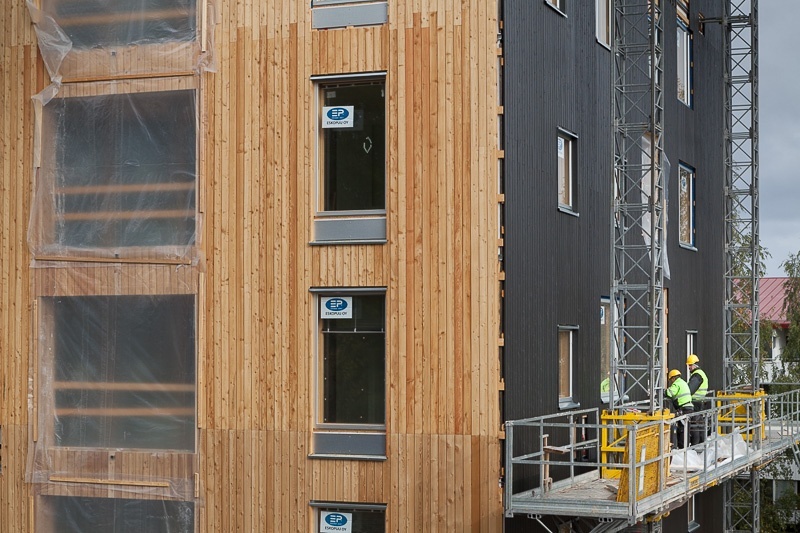 Eurocode 5 describes how to design wood buildings with timber in solid, sawn, planed or in pole form, glue laminated timber or wood-based structural products, (e.g. 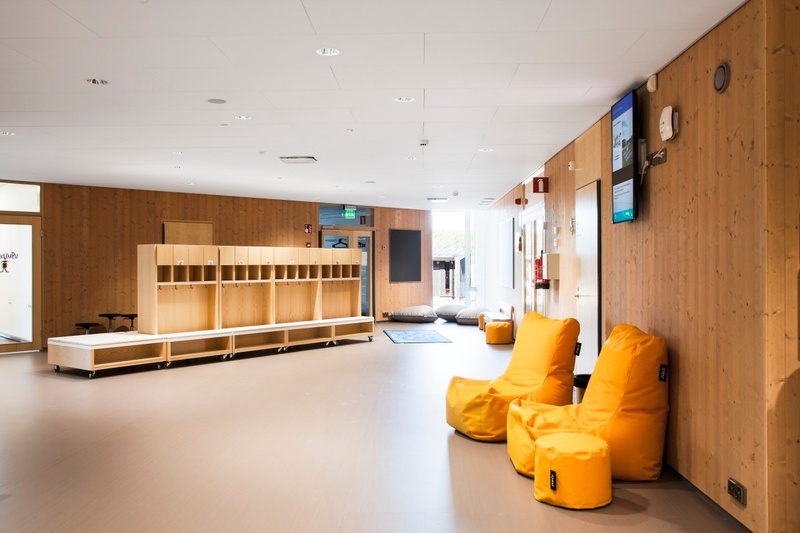 LVL and CLT) or wood-based panels. This includes also structural fire design regulations. As an example, wood products treated with Nordtreat fire retardants fulfill Euroclass B-s1,d0. This means that the products contribute in the fire to a very limited extent, their smoke production is very limited and no flaming droplets occur. Euroclass requirements for building materials are A1, A2, B, C, D, E and F. Smoke production and the formation of flaming droplets are expressed with the additional classes s and d. The smoke production classes are s1, s2 and s3, and the formation of flaming droplet classes are 0, d1 and d2. A1 Products will not contribute at all to the fire. A2 Products will contribute in the fire to an extremely limited extent. B Products will contribute in the fire to a very limited extent. C Products will contribute in the fire to a limited extent. D Products will contribute in the fire to an acceptable extent. E Products’ reaction to fire performance is acceptable. F No reaction to fire performance is determined. s1 The smoke production is very limited. s2 The smoke production is limited. s3 The smoke production does not meet the requirements of class s1 or s2. d0 No flaming droplets or particles occur. d1 The flaming droplets or particles extinguish quickly. d2 The formation of flaming droplets or particles does not meet the requirements of class d0 or d1. Wood is at the same time a combustible and fire safe material. In a fire, untreated wood chars evenly at a speed of about 1 mm per minute, so its performance in a fire situation can be predicted accurately. The required fire resistance of wood structures can be achieved by adding the size of the structure, by adding a protective cladding, by using a non-combustible insulation material and by improving the fire resistance of the wood structure with a fire-retardant treatment. Industrial fire-retardant treatment can be done by pressure or vacuum technology, by spraying, brushing or by dipping. For interior and exterior wood panels, treatment with fire retardants is the most common way to enhance product’s fire performance. Besides industrial treatment, the fire retardant can be applied also manually in connection with the building process. Fire retardants, known also as flame retardants, are substances that are used for slowing or stopping the spread of fire or reduce its intensity. Their operation is commonly accomplished by chemical reactions that reduce the flammability or delay the combustion of the protected material. Fire retardants may also cool the material through physical action or endothermic chemical reactions. For wood products, fire retardants are available as coatings and sprays which can be applied either manually or industrially. Also industrial pressure and vacuum treatment is possible. Fire retardants can be used for many applications of construction wood products: for structural wood products as well as for facades, interior decorations and fittings. Traditionally, fire retardants include harmful substances like boric acid, boron, bromides, formaldehyde and ammonia. Such treatment also requires separate decorative finish, which increases the building time and cost. The new generation fire retardants developed by Nordtreat are pH-neutral, water based solutions without any toxic substances. They influence the pyrolysis of wood by creating a protective char layer. This way treated wood also releases water vapor, which decreases the temperature of the combustion reaction, thus slowing down the spreading of fire. Ideally fire retardants improve the performance of wood also in other ways, e.g. 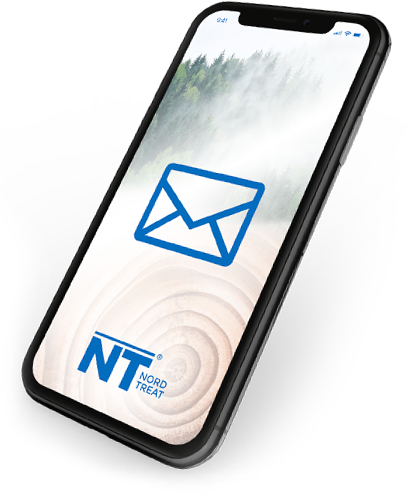 by preventing impacts of sunlight and weathering as well as enhancing wood material’s natural resistance against mould and fungi, like Nordtreat products do. The quality of the fire retardant solution together with the treatment method and treatment times will determine the actual fire safety performance of the wood product. The most simple and secure way is to choose industrially fire retardant treated wood products from a certified supplier. E.g. certified wood products treated with NT DECO will keep their fire safety properties in interior use unless the wood products are mechanically broken. In exterior use, the retreatment is necessary after 10 years. The retreatment must be conducted with the same product as originally used. Fire retardants for wood are available in covering paints and in translucent (clear or toned) stains. The fire performance of these options depends on the chosen fire retardant and treatment method. Wood is used in construction due to its many benefits, one of which is the natural look and feel with beautiful grain structures. They provide natural variation for the visible surfaces. 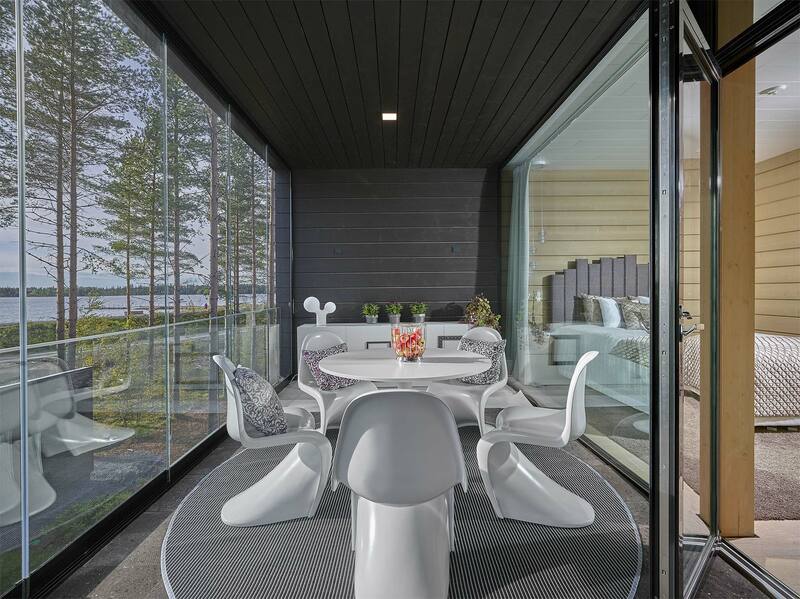 When the visual appearance of natural wood with grains is preferred, translucent fire retardant is the right choice. NT DECO is available in clear format and in thousands tones. The clear option keeps the natural color of the wood while toned offers unlimited options for design with color. The use of wood increases thanks to its many benefits and the evolving sustainability requirements for construction of living environments. Traditionally, many industrial treatment methods of wood have contained substances that are harmful for people, animals and/or environment. Today’s technology provides non-toxic options also for fire-retardants without compromises in performance. Nordtreat fire retardants are water-based, pH-neutral and contain only patented food grade compounds and non-toxic additives.